Not many Koreans may be aware that there is a considerable K-pop following in Pakistan. Just last year, a K-pop festival was hosted in Islamabad by the city’s King Sejong Institute and the National University of Modern Languages. According to NUML chief Zia Uddin Najam, however, it has not always been that way. “There was very little knowledge about Korea,” he told The Korea Herald, referring to when his university first started collaborating with the Korean government to run a King Sejong institute -- Korean language and culture education programs located around the globe -- in his country. “People knew Korea from the electronics companies and maybe some Korean drama. But the program really helped, especially the culture programs in helping (Pakistanis) know what Korea is all about. Since 2010, the King Sejong Institute of NUML has been conducting Korean language and culture programs in Pakistan, and the image of Korea has gradually shifted from the country of Samsung and LG to much more. Najam said while his university had a department dedicated to the language that started in 2006, it had not been very popular among students. 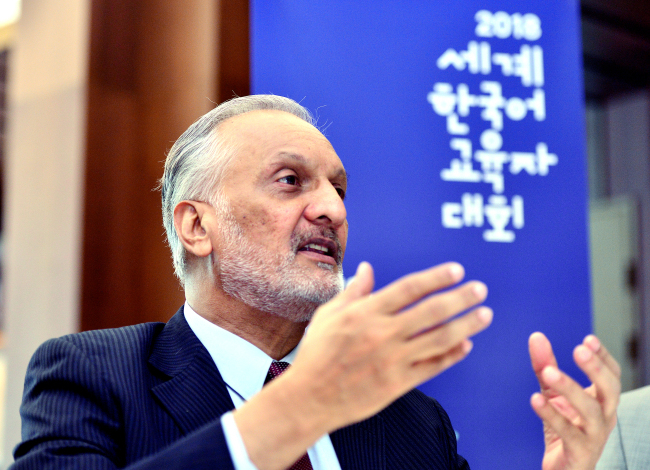 “A few years before King Sejong Institute started, the number of applicants were around 60s or 70s,” he said, adding that the school was uncertain how much buzz a Korean language program with Sejong Institute would create. Last year, he said, more than 800 applicants applied to the university’s Korean language programs. Language education is closely related to culture, he added, as the Sejong Institute puts great focus on Korean culture as well. “Inevitably when learning languages, it’s important to build up your perspective on that country,” he said. “Language and culture are intertwined. When you pick up a language, you always have a desire to learn more about the country. Pakistani students’ interest in the Korean language can be explained in multiple aspects; for one, it gives them an edge in landing jobs at Korean companies in their country. But the university’s officials say that the popularity of Korean culture in general is growing. Even as summer vacation ensues, there are students enrolled for a class that uses Korean TV dramas as course material. At the King Sejong Institute, there is a class each week that focuses on Korean culture. Najam pointed out that participating in the multinational program has allowed his university more opportunities to interact with education institutes from other countries. He indicated that his university intends to use this opportunity to reach out to Korean universities and interact with them, although specific plans have not yet been set. Last week, he took part in the World Korean Educators Conference -- hosted by the Ministry of Culture, Sports and Tourism and King Sejong institute Foundation -- where his university was commended and presented with a plaque of gratitude from Culture Minister Do Jong-hwan for the excellent operation of the King Sejong Institute. Najam stressed that through understanding foreign cultures, one acquires a key to broadening one’s knowledge of the world. The King Sejong Institute has some limitations, as most of its teachers are Pakistani. For example, there are inherent limits to their understanding of the culture as well as technical issues like pronunciation. Among solutions currently being suggested are the introduction and expansion of online classes that will give students more exposure to native Korean-speaking teachers.